PowerApps is a service for building and using custom business apps that connect to your data and work across platforms. Microsoft Flow makes it easy to automate workflows and business processes between your favorite apps and services. Both PowerApps and Microsoft Flow come with a variety of built-in connectors to data sources such as Office 365, Dynamics 365, Salesforce, and more. In some cases, app and flow builders also want to connect to data sources and APIs built by their organization. Similarly, developers that want to expose their APIs more broadly within an organization can make their APIs available to app and flow builders. This topic shows you how to export an API built with Azure Functions or Azure App Service. The exported API becomes a custom connector, which is used in PowerApps and Microsoft Flow just like a built-in connector. Before exporting an API, you must describe the API using an OpenAPI definition (formerly known as a Swagger file). This definition contains information about what operations are available in an API and how the request and response data for the API should be structured. 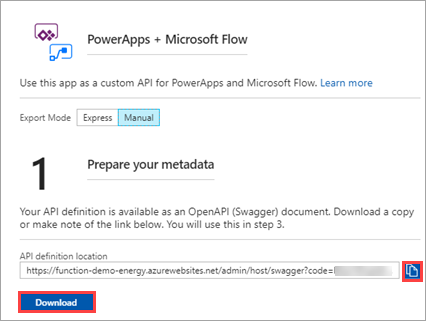 PowerApps and Microsoft Flow can create custom connectors for any OpenAPI 2.0 definition. Azure Functions and Azure App Service have built-in support for creating, hosting, and managing OpenAPI definitions. For more information, see Host a RESTful API with CORS in Azure App Service. 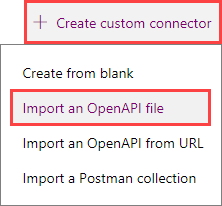 You can also build custom connectors in the PowerApps and Microsoft Flow UI, without using an OpenAPI definition. For more information, see Register and use a custom connector (PowerApps) and Register and use a custom connector (Microsoft Flow). In the Azure portal, navigate to your Azure Functions or another App Service application. If using Azure Functions, select your function app, choose Platform features, and then API definition. 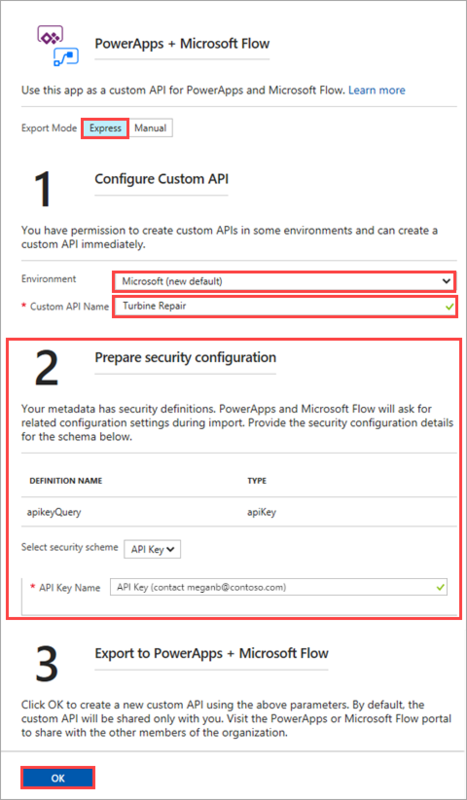 If using Azure App Service, select API definition from the settings list. The Export to PowerApps + Microsoft Flow button should be available (if not, you must first create an OpenAPI definition). Click this button to begin the export process. Express lets you create the custom connector from within the Azure portal. It requires that you are signed into PowerApps or Microsoft Flow and have permission to create connectors in the target environment. This is the recommended approach if these two requirements can be met. If using this mode, follow the Use express export instructions below. Manual lets you export the API definition, which you then import using the PowerApps or Microsoft Flow portals. This is the recommended approach if the Azure user and the user with permission to create connectors are different people or if the connector needs to be created in another Azure tenant. If using this mode, follow the Use manual export instructions below. The custom connector uses a copy of the API definition, so PowerApps and Microsoft Flow will not immediately know if you make changes to the application and its API definition. If you do make changes, repeat the export steps for the new version. Make sure you're signed in to the PowerApps or Microsoft Flow tenant to which you want to export. Use the settings as specified in the table. Environment Select the environment that the custom connector should be saved to. For more information, see Environments overview. Custom API Name Enter a name, which PowerApps and Microsoft Flow builders will see in their connector list. Prepare security configuration If required, provide the security configuration details needed to grant users access to your API. This example shows an API key. For more information, see Specify authentication type below. Click OK. The custom connector is now built and added to the environment you specified. For examples of using Express mode with Azure Functions, see Call a function from PowerApps and Call a function from Microsoft Flow. Click Download and save the file, or click the copy button and save the URL. You will use the download file or the URL during import. If your API definition includes any security definitions, these are called out in step #2. During import, PowerApps and Microsoft Flow detects these and prompts for security information. Gather the credentials related to each definition for use in the next section. For more information, see Specify authentication type below. This example shows the API key security definition that was included in the OpenAPI definition. Now that you've exported the API definition, you import it to create a custom connector in PowerApps and Microsoft Flow. Custom connectors are shared between the two services, so you only need to import the definition once. In the upper right corner, click the gear icon, then click Custom connectors. Click Create custom connector, then click Import an OpenAPI definition. Enter a name for the custom connector, then navigate to the OpenAPI definition that you exported, and click Continue. On the General tab, review the information that comes from the OpenAPI definition. On the Security tab, if you are prompted to provide authentication details, enter the values appropriate for the authentication type. Click Continue. This example shows the required fields for API key authentication. The fields differ depending on the authentication type. On the Definitions tab, all the operations defined in your OpenAPI file are auto-populated. If all your required operations are defined, you can go to the next step. If not, you can add and modify operations here. This example has one operation, named CalculateCosts. The metadata, like Description, all comes from the OpenAPI file. Click Create connector at the top of the page. You can now connect to the custom connector in PowerApps and Microsoft Flow. For more information on creating connectors in the PowerApps and Microsoft Flow portals, see Register your custom connector (PowerApps) and Register your custom connector (Microsoft Flow). During export, you provide configuration values that allow PowerApps and Microsoft Flow to authenticate users. This section covers the authentication types that are supported in Express mode: API key, Azure Active Directory, and Generic OAuth 2.0. PowerApps and Microsoft Flow also support Basic Authentication, and OAuth 2.0 for specific services like Dropbox, Facebook, and SalesForce. When using an API key, the users of your connector are prompted to provide the key when they create a connection. You specify an API key name to help them understand which key is needed. In the earlier example, we use the name API Key (contact meganb@contoso.com) so people know where to get information about the API key. For Azure Functions, the key is typically one of the host keys, covering several functions within the function app. To configure registration for the API, use the App Service Authentication/Authorization feature. 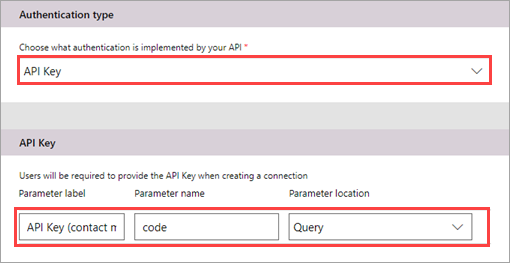 To configure registration for the connector, follow the steps in Adding an Azure AD application. The registration must have delegated access to your API and a reply URL of https://msmanaged-na.consent.azure-apim.net/redirect. 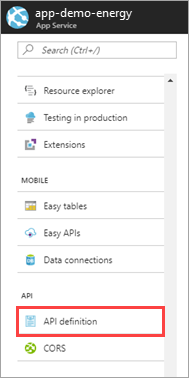 For more information, see the Azure AD registration examples for PowerApps and Microsoft Flow. These examples use Azure Resource Manager as the API; substitute your API if you follow the steps. Login URL - the base URL for Azure AD. In Azure, this is typically https://login.windows.net. Tenant ID - the ID of the tenant to be used for the login. This should be "common" or the ID of the tenant in which the connector is created. If someone else will import the API definition into PowerApps and Microsoft Flow as part of the manual flow, you must provide them with the client ID and client secret of the connector registration, as well as the resource URL of your API. Make sure that these secrets are managed securely. Do not share the security credentials of the API itself. When using generic OAuth 2.0, you can integrate with any OAuth 2.0 provider. This allows you to work with custom providers that are not natively supported.